You can set Drill query planning and execution options per cluster, at the system or session level. Options set at the session level only apply to queries that you run during the current Drill connection. Options set at the system level affect the entire system and persist between restarts. Session level settings override system level settings for the duration of the session. Planning options are prepended by planner, for example planner.enable_hashjoin. Execution options are prepended by drill.exe, for example drill.exec.functions.cast_empty_string_to_null. You can set planning and execution options for Drill from the Drill shell (SQLLine) or the Drill Web UI. Options set in the Drill Web UI are set at the system level. You can override system level options set in the Drill Web UI by setting the options at the session level from the Drill shell. Use the ALTER SYSTEM or SET commands to set planning and execution options at the system or session level. Typically, you set the options at the session level unless you want the setting to persist across all sessions. See Querying the Options Table. When Drill is running, you can access the Drill Web UI at http://<drill-hostname>:8047/. The Drill Web UI has an Options button located in the upper right corner that you can click to display an Options page. The Options page lists all the Drill options that you can set at the system level. To override an option for the duration of a session, set the option from the Drill shell using the SET command. The search field enables you to quickly search across all available Drill configuration options to quickly find options you are interested in. For example, you can search on the keyword "memory" for a list of all options related to configuring Drill memory. Starting in Drill 1.16, the Search field contains an x that clears the search field when clicked. Next to the search field are quick filter buttons that filter options by important keywords in one click. For example, the "planner" quick filter button quickly lists all options related to the query planner. The query planning options are prepended by the keyword "planner." Quick filters return options that include the keyword in the option name and/or description. Each option has a Default button that indicates whether the default value for the option was changed. If the Default button is not active, the option is currently set to the default value. If the default button is active, the value of the option was changed from the default. Clicking an active Default button resets the value of the option back to the original (default) value. The exec.query.max_rows option, introduced in Drill 1.16, automatically limits the number of rows that Drill returns from a result set. When you configure a limit, the limit is automatically applied by Drill when you run a query. You do not need to include the LIMIT clause. Configuring a limit on results reduces the amount of processing and streaming work for the web server when using the Drill WEb UI. The default setting for exec.query.max_rows is 0, which indicates no limit; queries will return all results. An administrator can modify the exec.query.max_rows setting at the system level (setting persists across restarts) from the Options page in the Drill Web UI or using the ALTER SYSTEM command. Alternatively, the option can be set at the session level (valid for a user session only) using the SET command or from SQLLine. The exec.query.max_rows option overrides row limit settings configured in the Drill Web UI and drill-override.conf file, which are described below. 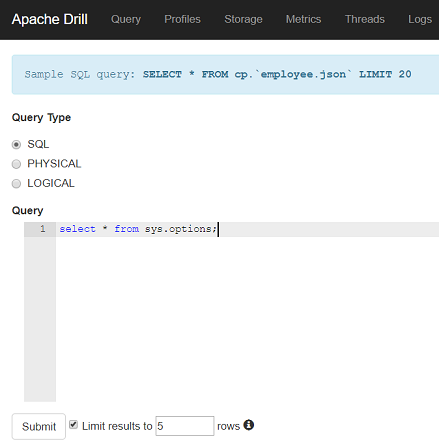 In addition to the exec.query.max_rows option, the Query page in the Drill Web UI provides a field where you can enter a limit on the number of rows returned from a result set when you run a query. Note: You can also configure the row limit for a REST client through the autoLimit parameter in the REST API. When you submit the query, results display across one or multiple pages. You can set the number of results that display per page. When results span multiple pages, scroll through the pages using the links in the bottom right corner of the screen. Clicking the Query Profile tab at the top of the results page displays the query profile with a warning stating that the results were automatically limited. Note that the exec.query.max_rows setting overrides the setting in the Web UI. For example, if the exec.query.max_rows option is set to 10 and you limit results to 20 on the Query page in the Web UI, Drill only returns 10 rows from the result set. The drill-override.conf file contains the same row limit setting as the Drill Web UI; however, the setting in the drill-override.conf file overrides the limit set in the Drill Web UI. Note that the exec.query.max_rows option overrides the setting in drill-override.conf and the Drill Web UI. You must restart the Drillbit after you modify drill-override.conf.